Photo taken November 2001- India. Click to see larger size. This dress is called Sari. Some also spell it Saree. Saris are common all over India. Saris are commonly known as a Hindu dress. Depending on the region in India- saris have different styles, patterns, fabrics, and even ways to wrap. One other way someone may ask "Do you know how to wrap a sari?" is "Do you know how to tie a sari?". What you find here on my page is only two or three ways to wrap a sari out of hundreds! A sari is a three piece garment - the sari itself (6 to 9 or more yards of sari - 5- 6 is typical), the underskirt and the sari blouse. (Sari blouses are also known as cholis or sari jackets.) Learn how to take measurements to tailor make your own sari blouse here.) A sari is wrapped in a particular way, it is not just a fabric which is thrown around the waist and chest and over the sholder. It has a method of folding and to keep in place, pinning. 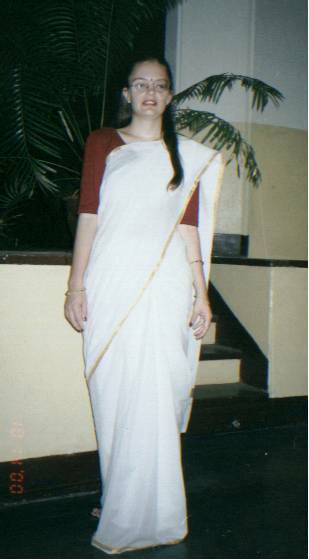 This photo of me to the immidiate left is of my 2001 Diwali sari - the newest fashion at that time in Chennai. Unlike most girls my age, I did not put pleats in the chest area, I threw it over the sholder and pinned it. I prefer this way, though some teased me since mostly grammas do this, or mothers in a hurry to dress. I find this more elegant, and less painful to keep in place and not reveal my middrift than the pleated way. However, not all fabrics agree to this! In modern times, you will see many Indian film stars of my age wearing sari like this, so it is fashionable. Learn how to wrap sari like most of the photos on my website. The following photos to the right are made thumbnail or smaller sizes, please click to see larger versions. 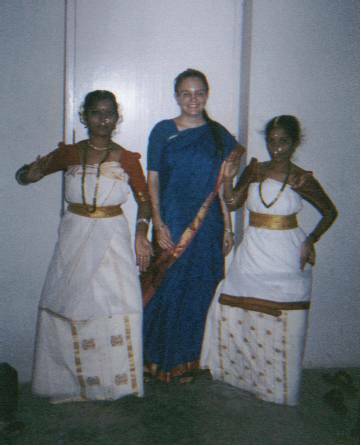 The top most photo is of me with two girls dressed in traditional Kerala saris. They have wrapped the saris for the traditional dance. Sometimes saris wrapped for the traditional dances are different than everyday wearing. I am in the center wearing my sari, wrapped in south Indian style. The second photo is of me alone, wearing the traditional Kerala sari wrapped in south Indian style. This sari can be made more grand (expensive) by enlarging the gold border. This sari has about an inch or two of gold border, the grander ones, may be half covered with border. Unlike in Tamil Nadu, where only widows wear white - and white is considered the color of death and funerals- this color sari is fine for Kerala. There are even special functions in Andhra Pradesh where the participants must wear white dresses as it is considered auspicious. Photo taken February 2001- India. Photo taken October 2000- India. This page has been visited times since it's inception in April 2002. Reviewed May 2004, August 2007.